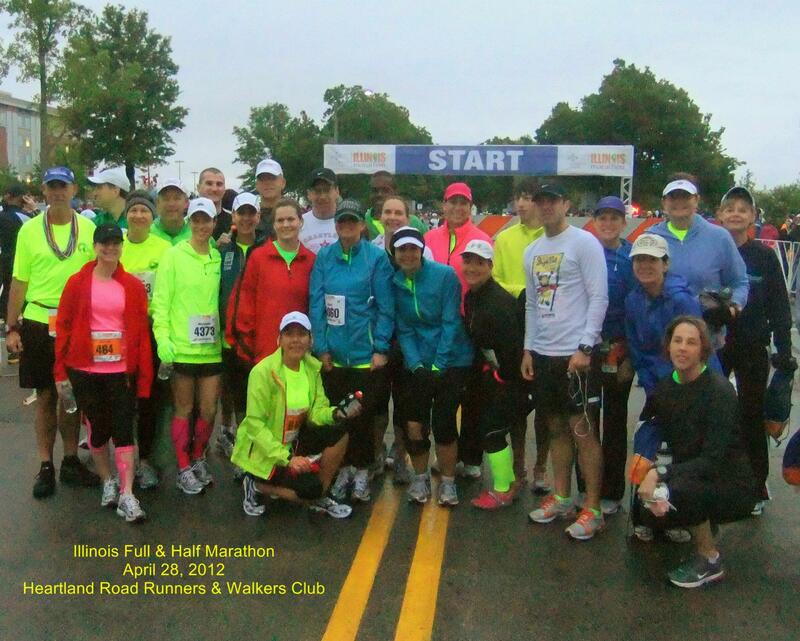 Most of the Heartland Roadrunners that made the trip to the Illinois Marathon. Doug, Jeff and I missed the pre-race picture while we were stuck in traffic. I wasn’t really sure where to go with this race report. I didn’t personally run very well, and since a day after the race I was sitting on my couch with a sore throat and fever, and by Tuesday morning I was at the walk-in clinic getting antibiotics for a sinus infection, I think the explanation for the slow run is now more clear. So, I’m going to give you my impression of the Illinois Half Marathon and I-Challenge and I’m going to try to keep my not-feeling-good whining to a minimum. Suffice it to say, I think I was on the verge of a pretty icky cold while I was running 16.2 miles in 12 hours, and that may have colored my experience a tad. 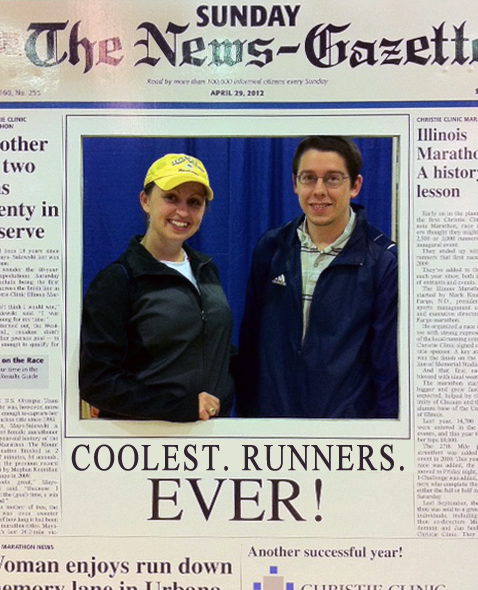 The days before the Illinois Marathon were simply full of obsessive weather-watching. Was it going to rain? Storm? I heard wind! Cold? What am I going to wear? Packing my bag on Thursday, I decided to not make a decision and just bring every piece of running gear I owned. I was super impressed with the organization of the check-in process. I remarked to my friend Doug that it was easier to check in for this race of 20,000 people than it was for the comparatively small Turkey Run back in Quincy! (No offense meant to the Turkey Run, which was also fairly quick!) There were plenty of volunteers, the lines were organized by race and number, and there was really no wait when we arrived. After we checked in, we headed over to the Expo. As we were walking in, Ultra-Marathoner and Everest-Climber Marshall Ulrich was leaving. I actually had not heard that he’d be there or I would have made a point to get there a little sooner- he’d be one inspiring guy to meet! Anyway, Doug and I wandered around a while and looked at booths from other races and checked out some of the merchandise on sale. The selection wasn’t nearly as large as the expo at the Little Rock Marathon, and I was disappointed that none of the vendors had any women’s trail running shoes, because I really wanted to try a few pairs on and take my favorite home. I bought a poster and a pint glass and Doug got a new water bottle and then we were off to the hotel. I only mention this in hopes of saving other people: do not stay in the Red Roof Inn in Champaign under any circumstances. The beds were rocks, the highway was so close I thought a semi would come through the wall at any moment, and the whole place shakes when someone in another room flushes a toilet. Worse yet, they charged $114 a night, with taxes almost $130… and that was just outright robbery. Not a place for a pre-run rest. 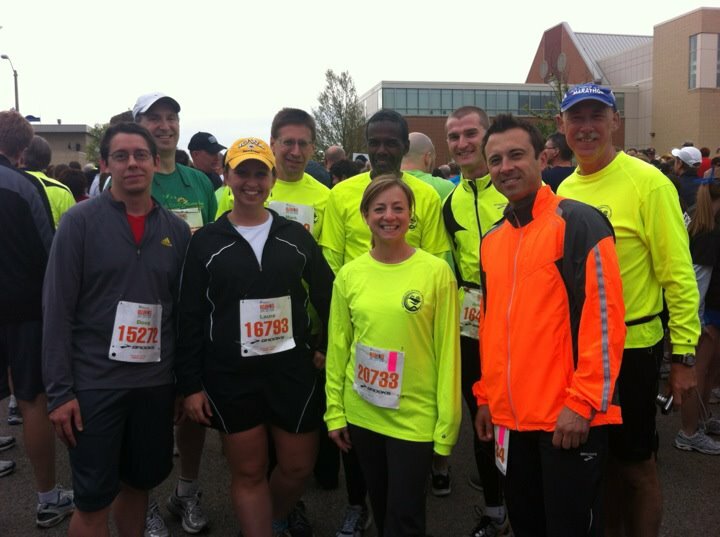 Some of the Heartland Roadrunners before the 5K. We were all participating in the I-Challenge by completing the 5K then a half or full the next day. The skies were swirling and grey when Doug and I headed over to the 5K on Friday night. It wasn’t raining, but it wasn’t pretty. We met up with some club members and snapped a photo and danced to a Michael Jackson song playing over the loud speakers. Someone said “Go!” and the 5500 participants all took off. Most everyone in our club was taking it easy on this run since we were all doing the half or full in the morning, so a lot of silliness was in store for the 5K. Running backwards under the fire truck flag arch! 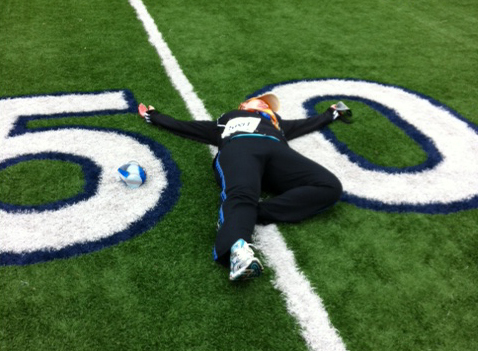 Strangely enough, that’s really all that I found particularly remarkable about the 5K all the way to the finish line. 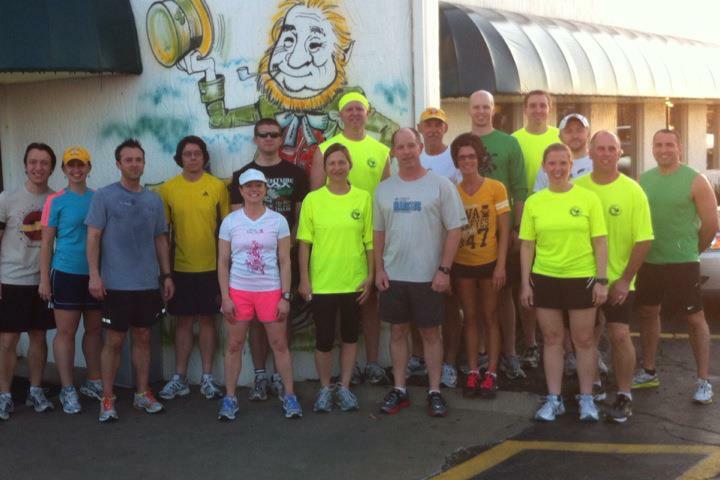 If there weren’t 5500 other runners, it would have just felt like any of the club runs we do in our town every day. The finish line is pretty darn neat though! After cruising through town, we headed back to the campus and toward Memorial Stadium at the University of Illinois. We ran through the tunnel and onto the football field, sprinted the 100 yards downfield, and made a U-turn to run to the finish positioned on the 50 yard line. There were lots of cheering spectators in the stadium, and as an alumnus of the University of Iowa Marching Band, it brought to mind my college days and the excitement of a Big Ten football game. Doug and I got our medals, met up with some of the other club members near the food area, ate a banana and were on our way. I guess the weekend was just not going my way at this point, because leaving the stadium my medal broke, we couldn’t find where we parked the car and had to wander 4 enormous parking lots for way too long, and it was almost 9 pm by the time we ate dinner. And of course, after that, we were back at the hotel, and I’ve already mentioned why that was no good. At about 4:50 am- ten minutes prior to our alarm- torrential rain, thunder and lightning woke us up. The first thing I heard was Jeff laughing. That’s just what we needed… a thunderstorm. When we poked our heads out the door of our hotel we saw many other poorly rested runners looking out at the same thing: a cold and soggy race day. There was nothing for it except to get ready and head back to the starting line though. I fussed over what to wear and finally decided to go with pants, an Adidas technical short sleeved shirt and my windbreaker jacket. Doug crossing his first half marathon finish line! Since everything had conspired to be more difficult than it should be, we managed to make the 3 mile drive to the stadium take 40 minutes. We finally gave up on the traffic, pulled the car in to a hotel near the congested intersection, and started walking to our corral. I think that’s when I noticed that it was only 8 minutes to the start of the race and that we were nowhere near where we were supposed to be… so we started running through crowds as best we could to get to the start line. I don’t want to sound so terribly negative about the half. All I know is that I couldn’t get my head in the game. I wasn’t feeling really ill (like I am today) but I also couldn’t get excited to save myself. Was it the weather? The hotel? The lack of sleep? Was I starting to get this chest cold/sinus infection so my energy was just low? I have no idea. I don’t want to make an excuse. I just didn’t feel real good at the start of this thing and I didn’t feel better as it went on. The Prairie path was at about mile 9. This is where the wind really kicked up for us. The rain had tapered off by the time the race started, but I think the weather still kept many spectators at home. The ones that braved the elements were enthusiastic though, and they cheered as we ran down the main campus area. I could tell Doug felt pretty good at the start of the race and was enjoying the feeling of his first big event. It was only a few weeks ago that I had that rush of adrenaline for my first big race at Little Rock, so his enthusiasm made me smile. We trained together for this race and had decided long ago that we were going to stick together for it. Even though I wasn’t feeling great, he honored that plan and stayed right beside me the whole time. It meant a lot to me that he stayed, and there was more than one moment where having a friendly face made all the difference to keep going. Lots of hardware to bring home. Logistically the course was fine. It seemed like water stops were well-placed, there was GU available, and there were bathrooms at water stops. There were lines at all the bathrooms though, so I’m glad I didn’t have to stop. They could probably double the number of porta-potties and help a lot of people out next year. 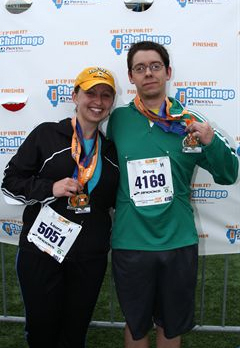 Doug and I celebrating completing the I-Challenge. Scenically, this was (and I’m really sorry Champaign…) sort of a dull course. While other race courses cross rivers, go through historic neighborhoods or pass important landmarks, this one just kind of meandered through the campus and some subdivisions. There was a mile or so of the course that went through a restored prairie park which could have been neat, but the plants aren’t high yet, so it was just a windy, cold grassland. If you’re looking for a flat race, this one is for you. If you’re looking for a scenic one, maybe not so much. 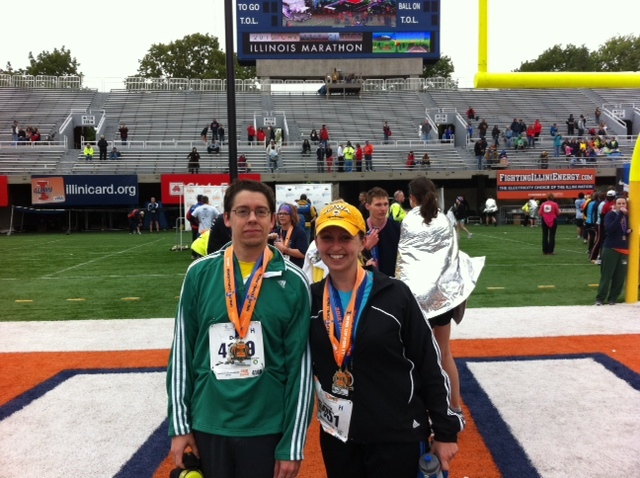 The course once again ended on the 50-Yard line of the University of Illinois stadium. It was somewhat less exciting to be doing that for the second time in 12 hours, but still neat. 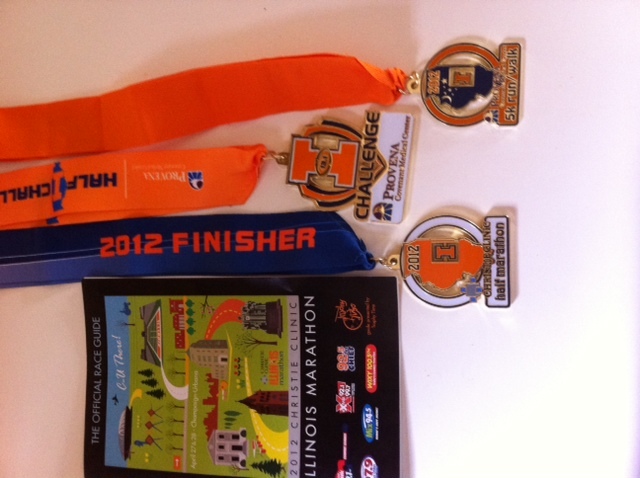 I was completely spent by the end and glad to grab my medals, snap a couple of pictures and get going. Probably the biggest highlight of the day was crossing the finish line with Doug for his first half. We trained together and it was great to share the moment. Our time was a 2:51, which is a slower per-mile time than all of our training runs and which is completely on me. I guess it was just a confluence of circumstances that led to a crummy run. So there you have it. It’s a tale of perseverance mostly. I’m glad, low energy or not, that I didn’t quit. I’m glad Doug finished his first half. I’m glad lots of Quincy runners completed I-Challenges, Halves and Fulls. And I’m glad that I run, even on days where it’s hard to find the sunshine. Does this Bib Number Make Me Look Fast? Well here I am again, dear readers, sitting just days away from my second half-marathon. 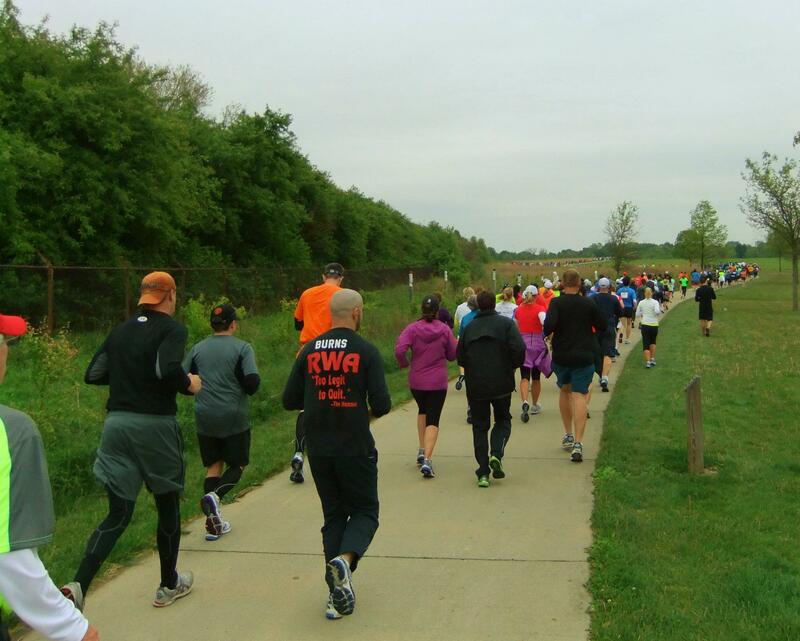 This weekend, 20,000 runners will be gathering in Champaign/Urbana for the Illinois Marathon, and among them, about 30 runners from the local Heartland Roadrunners and Walkers Club. Many of these members of the Heartland Road Runners will be participating in the Illinois Full and Half Marathons this weekend! I’m trying to decide if I feel more or less nervous going into my second half-marathon. 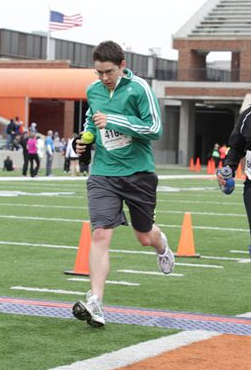 As you might recall, it was only a few weeks ago that I ran my first half marathon (13.1 miles) in Little Rock, AR. That event went relatively well. I had friends start the race with me, found a groove, and (except for a leg cramp in mile 10) the whole thing went off without a hitch. I had a lot of worries going into that race: crowds, nutrition, hydration, sleeping in a hotel the night before…finishing. None of that really ended up being a problem though. I guess I had good coaches, because I seemed pretty prepared and the race went just fine. My training partner Doug and I after the St. Louis "Frozen Buns Run"
For this Illinois Half, my worry list looks different. I’m not so concerned about finishing it- seeing as I’ve got several more double-digit mile runs under my belt now. I am running it with a partner, which will present its own challenges and advantages. Doug and I have been training together for quite a while now, so we’re used to running as a pair. When we run though, we tend to chat, and the cumulative effect can be somewhat bad for our overall time. Talking and laughing does make miles go down easier though, and that could be good for our time! And while we’re talking about time- I think that’s my biggest worry. I don’t need to smash my Little Rock finish, but I certainly would like to think that I could shave off a few minutes this go round. I didn’t have expectations in Little Rock. Illinois is billed as flat and fast, and I’m going to be bummed if I can’t do at least as well as Little Rock. One interesting wrinkle in the story for Illinois is the I-Challenge. The challenge is to run a 5K the night before the half marathon (or the 10K or full marathon, depending on your entry). The main reason to do this? The Bling. 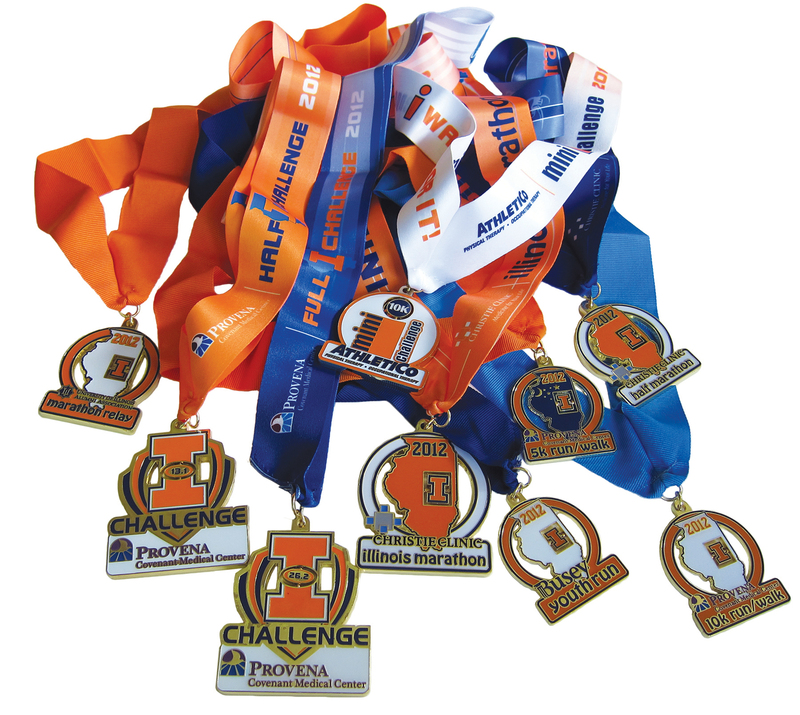 You earn a medal for the 5K, the half, and completing the challenge, for a total of 3 pieces of bling to wear home. 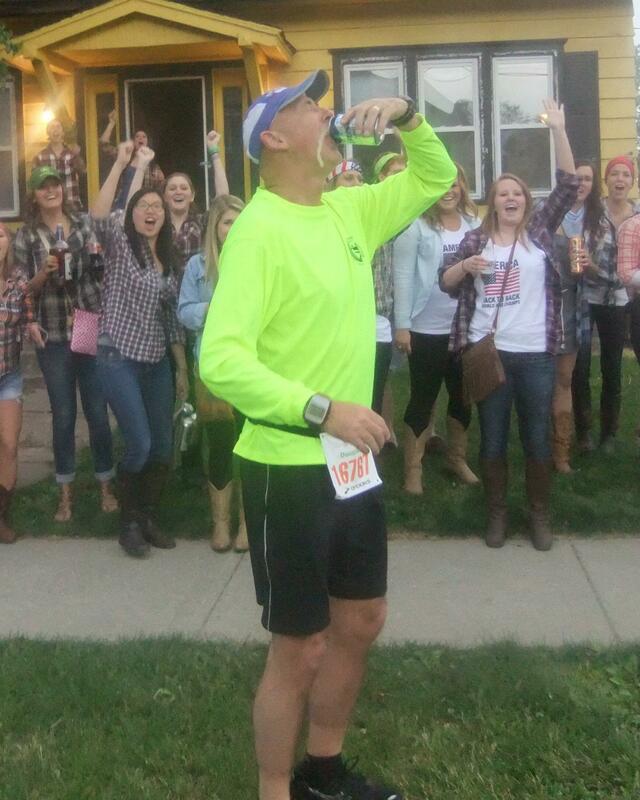 The real dilemma is how to run the 5K. I’ve really, really wanted to clock a time of under 30 minutes for a 5K this year. I’ve come close, but haven’t broken it in a timed event yet. I don’t think the I-Challenge is the place to go all out though… I can’t imagine that it’s a good idea to push myself too hard the night before a half-marathon. It’s about not quitting. It’s about continual forward progress. *Speaking of Jared… I’m headed out to Vermont to be a crew member for his attempt at the 200 mile McNaughton Trail Ultra Marathon early in May. Expect a pre-race blog on this soon, and updates throughout his event. ** And speaking of Half Marathons! 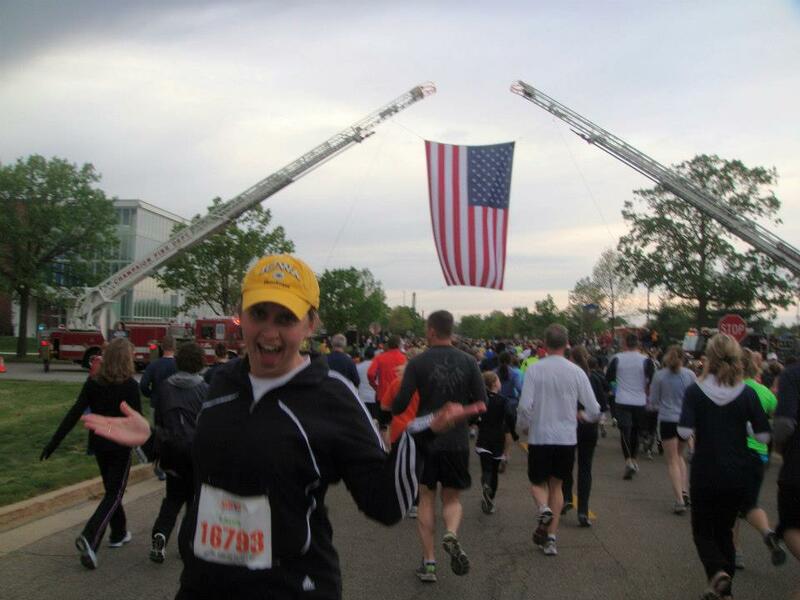 Good luck to my friend Jennifer who will be running a half in Nashville this weekend too! Maybe I can talk her in to doing a race report.. hint hint! I haven’t blogged in a few days, but I feel weeks behind on the news! I’m going to make like the top-of-the-hour headlines and give you the Blog in Brief! All of my family events around Christmas were over by the 24th, so my husband and I headed out to Lake Argyle State Park in Colchester, IL (1 hour from Quincy) to run some trails for Christmas Day. Here’s what I learned: I love that park but it needs a lot of work. The stairs and small bridges on portions of the trail are broken, slippery and dangerous. The lake is beautiful but the trails surrounding it are difficult to follow due to poor markings at intersections. They’re also full of stumps and roots that make trying to run ill-advised. It’s still a nice place for a hike, but you’re going to want to watch your feet. The highlight of the day came courtesy of the skies surrounding the park, where we spotted and photographed some immature bald eagles and a few red tailed hawks. In related news: I need to buy a pair of trail running shoes, as my old road shoes have no grip at all on wet leaves. Speaking of cycling, I’ve got big news! I’ve signed up for the Register’s Annual Bike Ride Across Iowa, better known as RAGBRAI. I’ll be riding with team #42: The Keokuk Bike Club. There’s still time to join up with the Keokuk Club if you’re interested in making the 6-day, 500 mile trip across the great state of Iowa for the traditional tire-dip in the Mississippi with me this July. I’ll write a full blog about RAGBRAI in the next week or two, but there’s no time like the present to start thinking about this ride. It’s the oldest bike tour in the country and draws participants from all over the world. The number of participants is limited and you must enter a lottery to get a spot on the ride unless you sign up with a team. Contact Jim Vincent, President of the Keokuk Club, jjvincent (at) iowatelecom (dot) net for more information on joining the team. There are two fun running events that have made my calendar for the beginning of 2012. 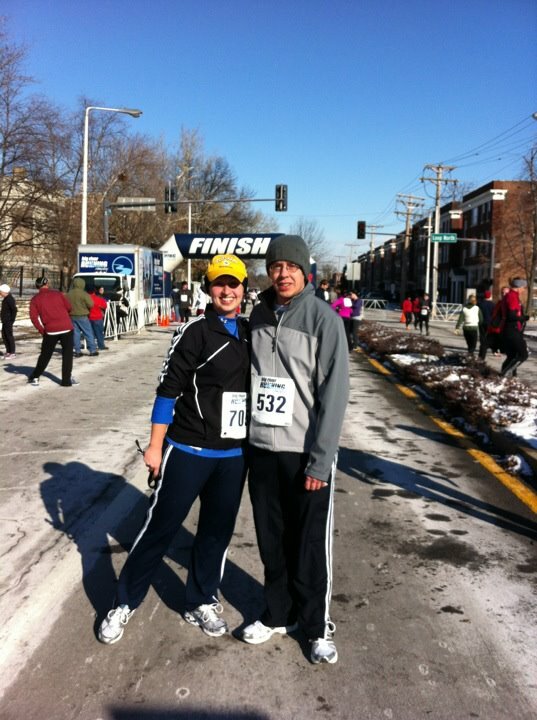 The first is the Frozen Buns Run 5K and 10K in St. Louis on January 14th. The event starts and ends at Blueberry Hill on the Delmar Loop (near the Pageant Theater) and funds will benefit the St. Louis Triathlon Club. Sign up is $20 ($30 on the day of the event) and includes the after party with live music at Blueberry Hill! The second event is the Catch Cupid if You Can 5K in Hannibal, MO. This 5K fun run/walk is 10 a.m. Feb. 11, 2012; at Riverview Park in Hannibal, MO. Registration starts at 9 a.m. Proceeds will benefit the “Kids in Motion” program. Register by Jan. 27, 2012, to be guaranteed a T-shirt. Every female participant will receive a rose at the end of the course! The Roadrunners After Dark have chosen Jimbeana’s Restaurant at 130 South 10th Street in Quincy as a meeting location for January. The informal group welcomes new runners. We’ll be running from the parking lot at 6:45 each Tuesday night and then meeting back at Jimbeana’s 45 minutes or so later for food and laughs. Most nights there are several routes ranging from 3 miles to 6 miles in length to choose from. Your Adventure Foot could be Blog Famous! Upload a picture of your foot having an adventure to the Adventure Foot Facebook Page before February 12th, 2012 you could win a $20 Visa Gift Card!! I’ll choose one winner via random number generator from all of the entries. The only rule is that you must click “like” on the Adventure Foot Facebook page! See the Photo Gallery for more info. Hannibal Parks and Rec will be holding an Ice Bowl Disk Golf Tournament on Feburary 18th at Huckleberry Park. The $10 sign-up fee will benefit the Douglas Food Pantry. Tim 115 pounds lighter running the Bridge the Gap Half Marathon. Before starting my current career, I grew up working on a ranch and working for the U.S. Forest Service cutting down trees. So, I was very physically active whether that was wrestling steers, stacking hay, cutting trees, stacking logs, or whatever it may be. I graduated college and started a career where I sat at a desk. I went from being able to eat whatever I wanted and keeping somewhat under control, to leading a more sedentary lifestyle. I won’t kid you: I was never a small guy, but I was a lot more in shape. So, after three years of sitting at a desk I quickly went to being over 300 lbs. The company moved me twice so health wasn’t on the top of my list. I was offered a third position move to Des Moines, IA I decided I had gotten to a point that something needed to be done. I started hurting all over on joints, pain in my chest, and just plan out unhealthy. In April 2008, I started to do something about it. My starting weight was 312 pounds. I didn’t have much of a plan. Luckily for me, I had a coworker that worked out every morning, so I tag along to get started. It wasn’t pretty at the beginning; in fact it was plan out ugly and embarrassing. My first time on a tread mill, I’d covered not even a quarter of a mile, and I was breathing so hard that I sounded like a grizzly bear stuck in a barbed wire fence. I made dietary changes. I stopped drinking all soda and stuck with coffee in the mornings and water the rest of the time, and, except for an occasional alcoholic beverage, that was it. I quite eating all candy, deserts, snack food, and all other sweets. I only went out to eat if it was a business function, holiday, or family event (this was probably the hardest part for me because Des Moines has Taco Johns and it is my favorite restaurant ever, and I hadn’t lived around one for 6 years). I had a small breakfast in the morning, yogurt at 9 am, small lunch of protein/vegetables, an apple at 3pm, and a small dinner. It took time to get my body used to not over-stuffing at each meal. I got used to getting up a 4:30 a.m. for my workout, and eating healthy the first year. I went from 312 pounds from April 2008 to 250 pounds by May 2009 when I ran my first Bridge the Gap to Health. I ran the 5K with a goal to finish in under 30 minutes. I finished in 30 minutes and 31 seconds. My time was a little heart breaking, but motivating. 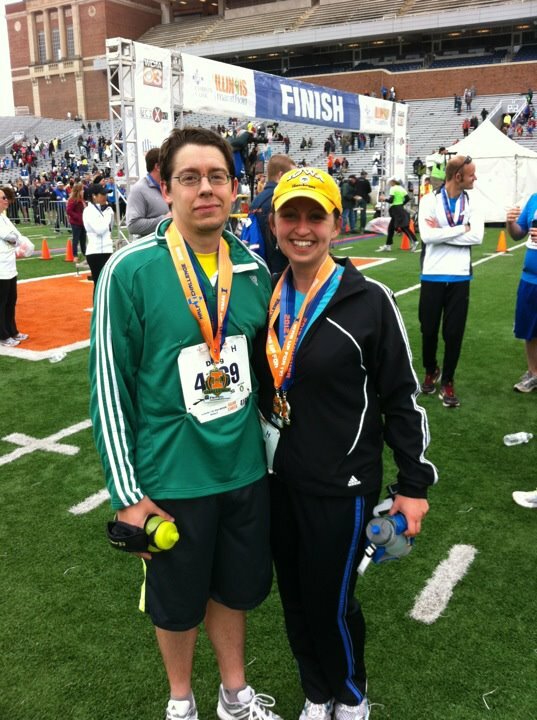 After finishing the race I decided I would run the half marathon the next year. I don’t really know what I was thinking at that moment, because that is over 13 miles. My training became more intense. I ran five days a week, four short runs and one long run. I gradually worked the distances up as the year went on. I ran into a few setbacks with an ankle roll, pulled muscle, and dieting issues. I actually got to a point of exhaustion because I wasn’t taking enough calories for all exercising I was doing. I learned a lot about taking in the right carbs, sugars, potassium, protein to be a runner, and that became an important part of training for my half marathon. Three months prior to race I cut all liquids besides water out and stuck to a strict diet. The day of the race I weighed in at 194 pounds. That was a total loss of 118 pounds by race day. My goal going into the race was to finish in 10 minute miles. After working through the crowd at the beginning and battling my nerves, I finally settled into my pace at about mile three. 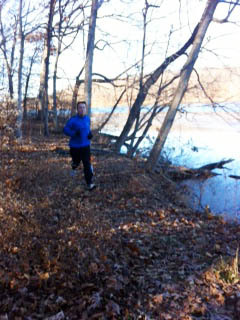 The temperature of 37 degrees was in my favor, because I did all of my training outside, even through the winter. From mile 3 to mile 10, it was normal running for me. I covered the ground quick and easy and had no issues. At mile 10 the pain started kicking it, starting with the ankle I rolled, pain with every step worsen as the time went on. The last mile, my pulled muscle from early in the year starting tightening and it made it a struggle to focus. All of that pain went away as I saw the finish line a half-mile away though. Finishing the race wasn’t just a relief, it was also extremely emotional. My 2-year goal of hard work and dedication came to an end and had paid off. I finished the race ahead of my goal of 10 minute miles. My official time showed an average of 8 minute and 19 second miles. Training for Bridge the Gap and losing the weight has made an amazing difference in life. I now have the energy to do whatever. It’s great being able to play with my nephews and nieces without breathing heavy. I can work on the farm and keep up with everyone else. I feel better all-around. The confidence factor has come slower though. A lot of people are amazed how I look, and comment on me looking so much better. It has taken me almost a year later for me to see that same thing. I watched myself as a big guy my whole life and it came off slowly over 2 years, so the change was gradual for me. My advice to people who would like to be more active and get healthy is this: Anyone can do it, it takes time, dedication, hard work, and a mindset of success.